It was a night of firsts for Caitlyn Jenner on the premiere of "I Am Cait" -- including a makeover from one of her daughters! 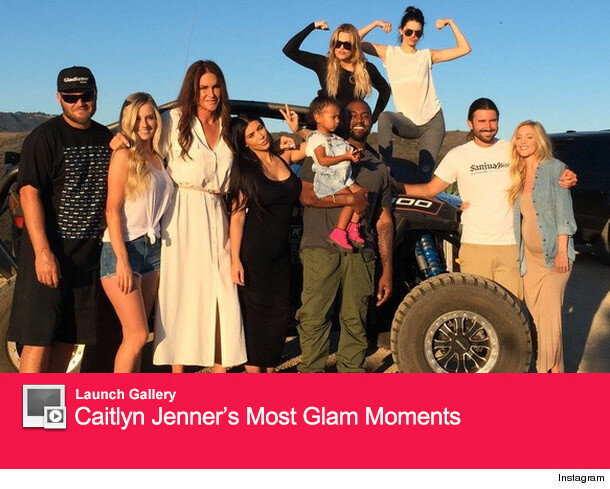 During the hour-long episode, fans got to see Caitlyn's family "meet" her for the very first time, as Kylie Jenner, Kim Kardashian, Kanye West and Caitlyn's sisters and mother finally saw her after her transition. And while her mother had a ton of questions and admitted it will be a struggle to leave Bruce behind, the reaction was still largely supportive. For Caitlyn though, her biggest concern was her children. Some of her fears were pushed aside when daughter Kylie made a surprise visit to her house, the teen saying in a confessional, "I do want to meet her. It will be a little bit uncomfortable in the beginning, but I think we're both ready." Their interaction wasn't awkward at all though, as Kylie eventually helped give Caitlyn a makeover by giving her some of her infamous teal hair extensions. Check out the glam session in the video above. After her daughter left, Caitlyn expressed some doubt over her children's positive reactions to her sister. "[Kylie] would never come over. I would invite her over and this and that, she would never come. Khloe hasn't been here. Kourtney hasn't been here and met Caitlyn. Rob. Maybe them not being around is their way of saying, 'I don't know if I really agree with this,'" she said. "They keep saying it to me openly, 'Everybody's great, we want you to live your life' and then they never show up. So you know something else is going on in their heads. For most people, there's a lot of families that are torn apart by it. I don't want to tear my family apart." To be fair, many of the children have been seen with Caitlyn since taping the first episode -- and almost all of them supported her when she accepted the Arthur Ashe Award at the ESPYs earlier this month. Kim and Kanye showed up later, where the rapper shared his insight into her transition. "I think this is one of the strongest things that have happened in our existence as human beings, that are so controlled by perception," Kanye said. "You couldn't have been up against more." In a tease for the rest of the season, we see some issues pop up between Caitlyn and her former stepchildren though. At one point, Jenner says Khloe Kardashian wasn't happy with how she was painted in the Vanity Fair article, while Kim confronts Caitlyn, telling her, "You look amazing, it's your time, but you don't have to bash us." What did you think of the premiere episode? Sound off below. For more of today's hottest headlines, check out the video below! What Was Kanye West's First Interaction with Caitlyn Jenner Like?